Optimal energy utilisation is an integral part of any production process. TLV has developed sophisticated systems for the recovery of energy contained in flash steam. The flash vessel provides a simple and efficient method to make use of flash steam in the condensate recovery system. Inside the flash vessel, the condensate and the emergent flash steam separate from each other. The steam rising to the top can be fed into a steam line for a technical application, and therefore the steam generation is reduced in the boiler. Additional savings are obtained through reduced expenditure on water purification. 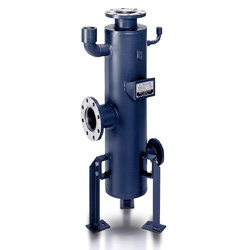 Successful application of flash vessel systems depends on the flash vessel's sizing, a stable pressure control, and the effective draining of the condensate. TLV provides competently designed flash recovery systems complete with a flash vessel and all the necessary valves to control and safeguard the condensate line.